2) Participation in All of A.A. ̶ Is My Triangle Balanced? And Get the Pre-Conference Documentation Here! Click the image above or here to download a pdf of the flyer. Meeting opened: 3:00 P.M. with the Serenity Prayer. Lance B. chaired the meeting. Members present: Lance B., Cathie D., Tony L., David P., Bobby A., Sue T., Kathy C., Mike N., Kelly C., Rick L., Judy W., Jay L., Patricia C., Susan S., Teresa H., Gene H.
Read by Bobby A. Motioned and passed. A Motion was made and passed to add the Cleveland AA Group to District 2. Meetings are held at the Cleveland First Baptist Church, 36632 State Hwy. 79 Cleveland, AL. 35049. Tuesday and Thursday 12:00 p.m. OD/NS . Mike N. attempted to contact Rickwood Caverns to schedule 2016 district picnic. He received no answer. He will try again this week. No decision was made at this time concerning picnic speakers. Sue T. is looking for a gratitude dinner speaker. Motioned and passed to establish a $2,000.00 dollar district 2 prudent reserve. Funds exceeding this amount will be split and sent to GSO and area. Motioned and passed to accept newly designed district 2 website. Motioned and passed to have an AA History Workshop at the Downtown Cullman Group. 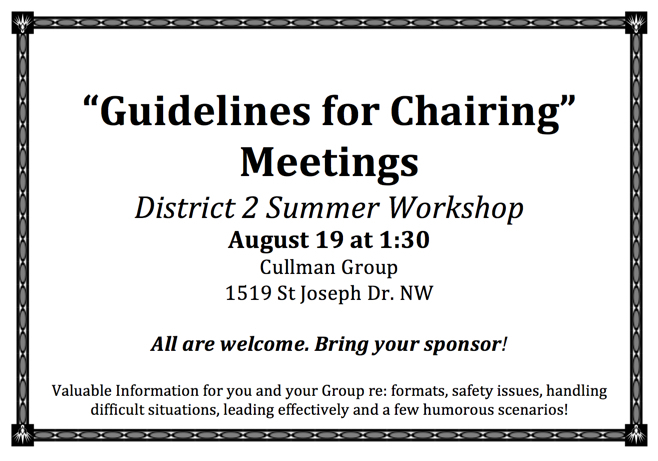 Scheduled for Saturday August 20th, 2016 from 1:30 p.m. – 3:30 p.m.
Sue T. will develop flyers for the workshop and forward them to David P. to be added to the district 2 website. Motioned and passed to adjourn meeting at 4:00 p.m. The next district 2 business meeting will be held at the Goose Hung High Group on Sunday April 17th 2:00 p.m. located at Church of the Nazarene 5415 AL Hwy 157 Cullman, AL. 35055. Members present: Lance B., Tony L., Bobby A., Sue T., Kathy C., Rick L., Kelly C., Gene H., Suzette D., Mike N.
Secretary’s Report: Read by Bobby A. Report approved. Motioned & passed. Treasury Report: Read by Sue T. in David P’s absence. Report approved. Motioned & passed. Sue T. made copies of the new District 2 meetings list. Ten copies per group were distributed to members present to be distributed to remaining groups. She requested that any corrections or changes be directed to Bobby A. of the Hartselle Hope group. Changes will be made to master copy and distributed to each group. The Allgood Group has been dropped from the new meeting list. The District 2 website is down at this time. Suzette D. mentioned a new AA meeting in Cleveland Al. Meetings are held on Tuesday & Thursday 12:00 P.M. at the First Baptist Church, 36632 State Hwy. 79 Cleveland, AL. 35049. Contact Susan at 205 837-5436. Rick L. suggested a GSR or alternate DCM attend this meeting to verify that AA guide lines are being followed. After being approved by GSO their group name will be added to the Meetings list. Mike N. will contact Rickwood Caverns to schedule the 2016 Picnic. Target date is June 11, 2016. Sue T. will coordinate the 2016 Gratitude Dinner. Contact Sue T. with suggestions for speakers. Meeting adjourned at 4:00p.m. followed by the Lord’s Prayer. The next District 2 business meeting will be held Sunday February 21, 2016 3:00 p.m. at the Cullman Downtown Group.